The Armoy Road Races has received another sponsorship boost with the news that Torquetronix will back the Open Superbike race in July. The Kells, Co Antrim-based bespoke tuning company is embarking on a new venture in race sponsorship and owner David Wishart said: “Sponsoring a road race is something new for us. I have to say when I was first approached about sponsoring a race it was very easy to say yes to Bill Kennedy and his team. Last year the Open race was one of best of the day, with Guy Martin, Michael and William Dunlop all in the mix for the top three places before Martin claimed a hard-earned victory. Bill Kennedy, Armoy Clerk of the Course, added: “The club is absolutely delighted with the news of a new Open Race sponsor. There have been a few changes this year with one sponsor and another and with that usually comes a bit of curiosity. “I admit that road racing has had a tough time over the last number of years and whether the Armoy Club is getting it right or whether we have a lot of luck, there might still be some debate. To be honest I’d say it’s the hard work from dedicated people who are passionate about these races and their club, making sure the top national road race in Ireland remains in Armoy. We are hopefully making our own luck,” he added. SGS International was recently confirmed as the new title sponsor of the ‘Race of Legends’ on July 25, taking over from RiverRidge Recycling. 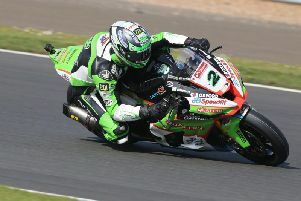 Meanwhile, there was disappointment for Jamie Patterson at the Daytona 200, who was ruled out of the famous race in Florida with clutch failure after qualifying in 14th place. Last year’s winner, Danny Esclick, came out on top by 0.006s from Josh Herrin.